What Does NASA Mars Lander's Launch Delay Mean for Red Planet Exploration? 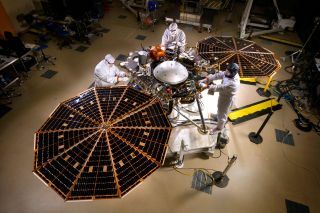 The solar arrays on NASA's InSight Mars lander are deployed during a test on April 30, 2015 inside a clean room at a Lockheed Martin Space Systems facility in Denver. InSight had been scheduled to launch in March 2016, but a problem with an instrument means the lander won’t launch until mid-2018, if it gets off the ground at all. The launch delay and possible cancellation of NASA's next Mars lander shouldn't affect the agency's other activities at the Red Planet going forward, officials say. On Tuesday (Dec. 22), NASA announced that a leak in the vacuum chamber surrounding a key scientific instrument will prevent the InSight Mars lander from blasting off in March 2016 as planned. The space agency will now work to determine whether to target the next available launch window, which opens in mid-2018, or to cancel InSight altogether. "While we're really interested in the results, it doesn't affect the sequence of either any of our other scientific missions — say, Mars 2020 — or our collaboration with the European Space Agency on their ExoMars program," Grunsfeld added. "And as far as the longer range, it doesn't add any dependencies for future human exploration." Mars 2020 is NASA's next Red Planet rover mission, which aims to launch a six-wheeled robot in 2020. Once it touches down, the $1.5 billion 2020 rover will search for signs of past Mars life and collect samples for a potential future return to Earth, among other duties. ExoMars will also hunt for possible Martian biosignatures, from orbit and the surface. The plan calls for launching an orbiter and technology-demonstrating lander in 2016, then following with a rover in 2018. As far as crewed exploration goes, putting boots on Mars is NASA's top priority over the next few decades. The agency is working to get astronauts to the vicinity of Mars by the end of the 2030s. The InSight mission — whose name is short for Interior Exploration using Seismic Investigations, Geodesy and Heat Transport— was designed to reveal key details about Mars' internal structure, including the size of the planet's core. The lander is outfitted with two primary instruments — a suite of three seismometers supplied by the French space agency CNES (which is the one experiencing the vacuum-chamber leak), and a self-burying heat-flow probe provided by the German space agency, known as DLR. InSight's planned work "is extremely important science," Jim Green, head of NASA's Planetary Science division, said during Tuesday's teleconference. "We know the interior of the Earth very well, but of the other terrestrial planets, Mars is our really only hope to be able to make those kinds of measurements that allow comparative planetology in this particular area, in terms of how planets are put together early on in the solar system." And while Grunsfeld described InSight as a stand-alone mission, the lander's observations would nonetheless be of interest to future Mars astronauts, Green said. "How active that particular planet is may be very important from a seismic perspective," he said. The heat probe, Green added, "also can provide information about how the planet is cooling over time, perhaps to be used for human exploration in other ways. So, things that we do at Mars do indeed have important context to human exploration."